The Cardinals have reached a contract agreement with lefty reliever Randy Choate, according to ESPN.com's Jayson Stark (via Twitter). The contract is for three years, tweets Jon Paul Morosi of FOX Sports. It's worth $7.5MM, according to WFAN's Sweeny Murti. St. Louis had been seeking a left-handed specialist to pair with Marc Rzepczynski in its bullpen, and was said to be considering a number of options. The team fell out of the running on Sean Burnett earlier in the day. 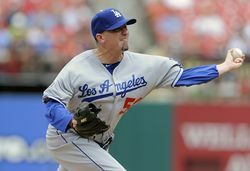 Choate, 37, is one of MLB's quintessential LOOGYs, pitching just 38 2/3 innings in 80 appearances for the Marlins and Dodgers in 2012. Over the last three seasons, he has a 3.25 ERA to go along with a 9.1 K/9 rate in 108 innings. Photo courtesy of U.S. Presswire.